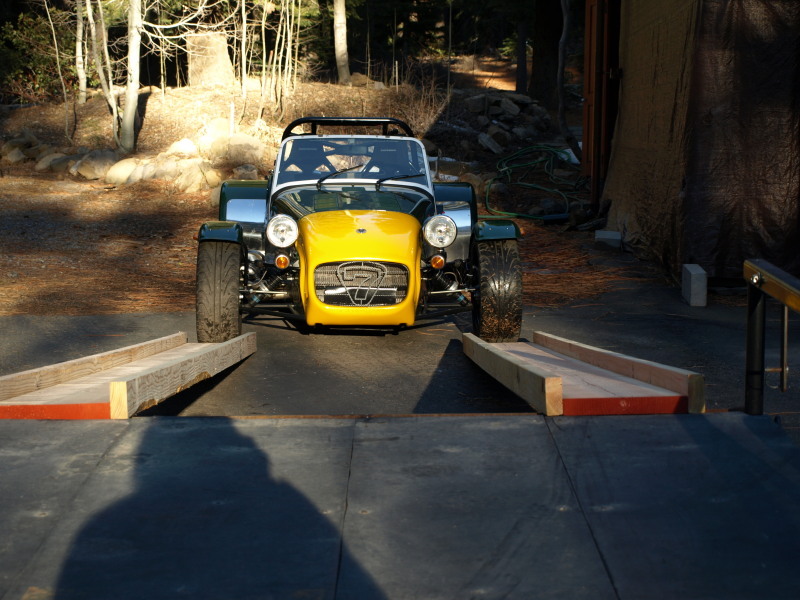 I bought some Douglas fir, two 2″x12″x12′ and four 2″x4″ x12′ and made 2 ramps. The wood was still ‘green’, so the ramps were really heavy – hopefully they will dry out and get lighter. Drove the seven on up the ramp without incident, stopping midway to check clearances and take photos. 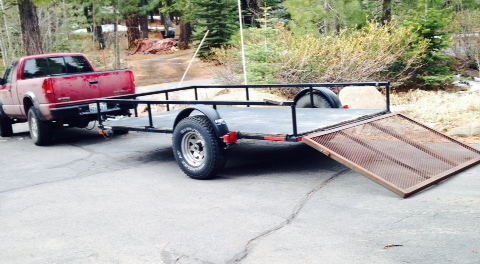 A couple of days ago, we bought a trailer from Featherlite in Reno. 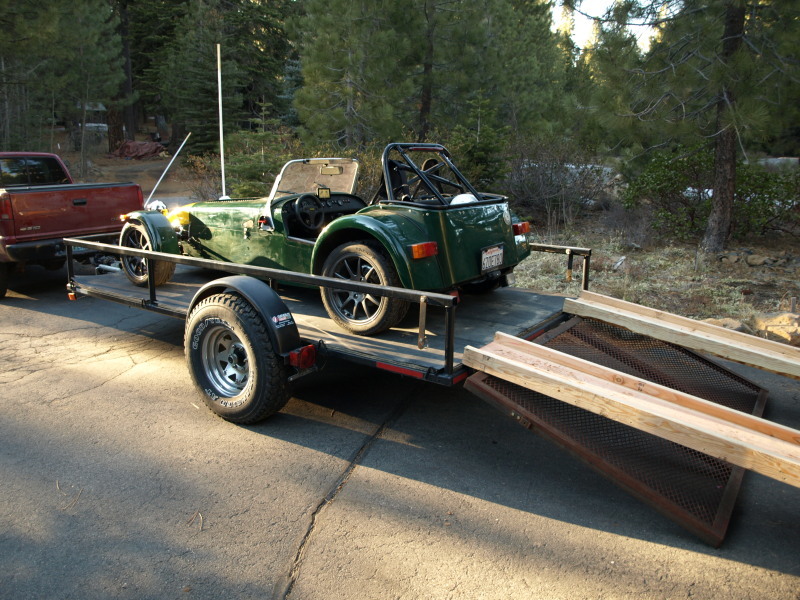 Its a 12′ x 6′ utility trailer for a gross towing weight of ~3000 lbs, and the basic trailer weight is ~980 lbs. 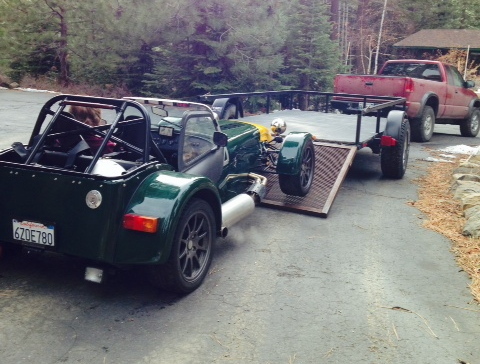 so should be perfect for a 7 that measures 10′ x 5′ and weighs 1100 lbs. This will allow us to take the 7 with us on longer journeys = like Seattle (Dot can go mushroom hunting with Maimun and I can do a track day with Bruce Beachman). Had to install a heavy duty trailer hitch to my Chevy S10 truck. Took me about 90 minutes to install at the dealers. 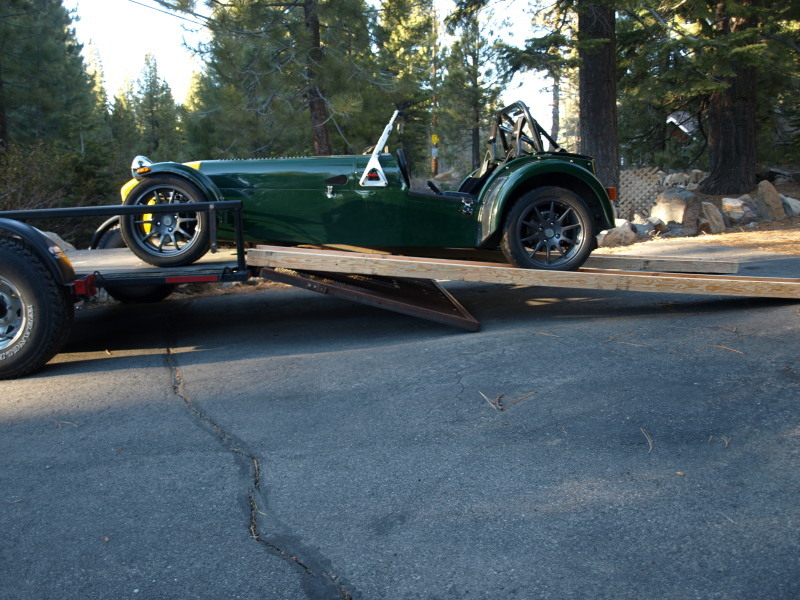 Then we towed the trailer home. Today I decided to try out the trailer for size with the 7. I drove it about half way on, then high centered it. The back end of the transmission caught on the trailer as well as the muffler. 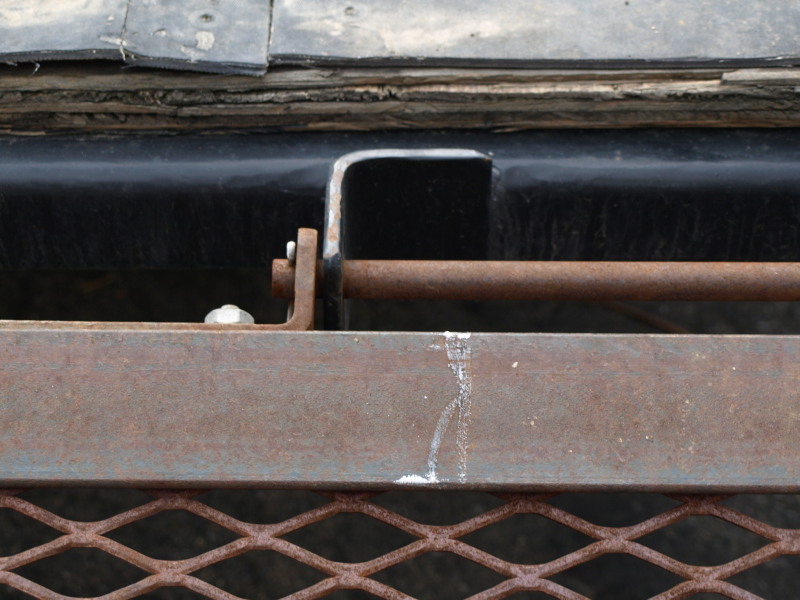 The tailgate of the trailer doubles as a 4′ ramp – which is too short, causing the 7 to bottom out. 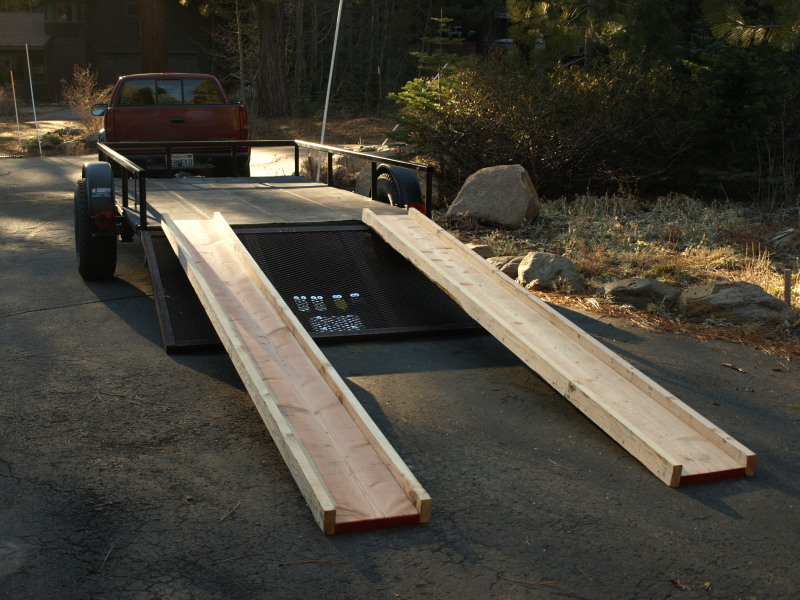 I need ramps about 10′ long. I called Dustin at Featherlite, he doesn’t have ramps that long but could fabricate some. He suggested trying some 2″x6″s. 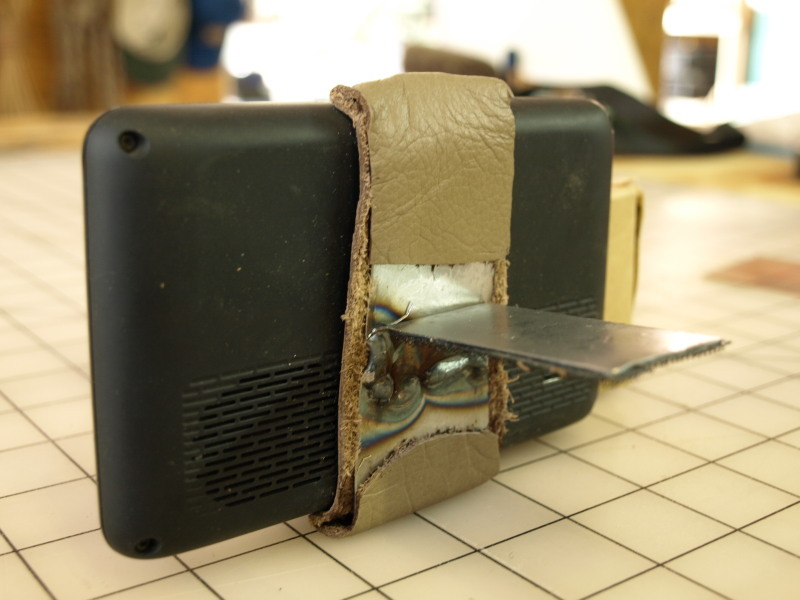 I’ll plan to get a couple of 2″ x 12″ s, 12′ long & some 2″x4″s for under bracing. 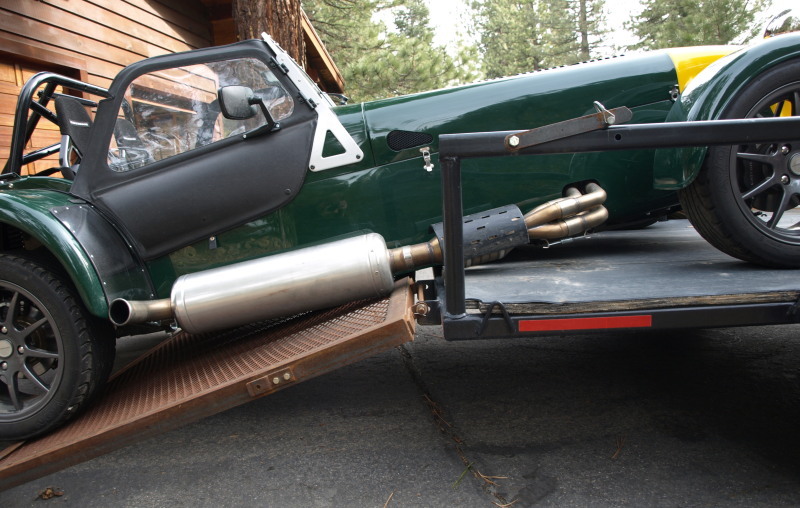 With the trailer connected to the truck tow hook, the rear end of the trailer is 21″ above ground. 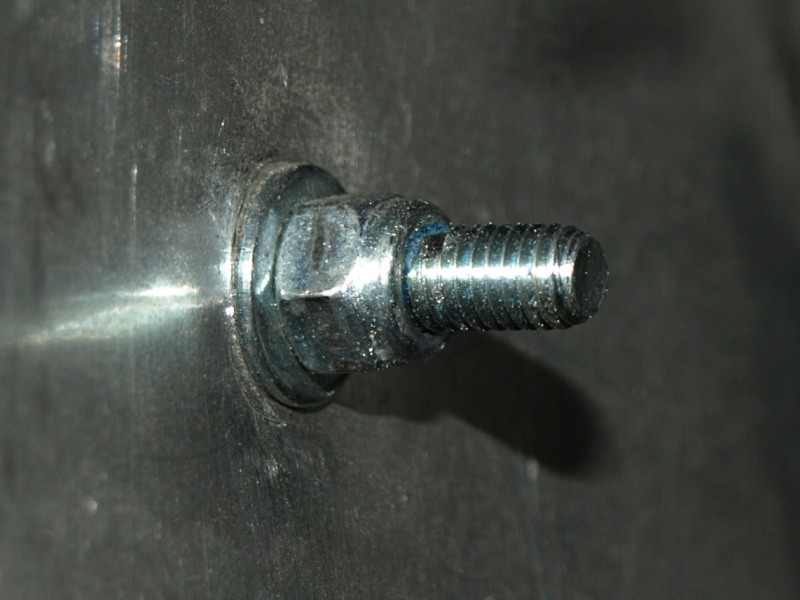 There is a screwing device at the front of the trailer with an 8″ solid wheel – I had screwed that down until I could see the wheel mounting begin to stray from 90 degrees, indicating imminent failure by overload. 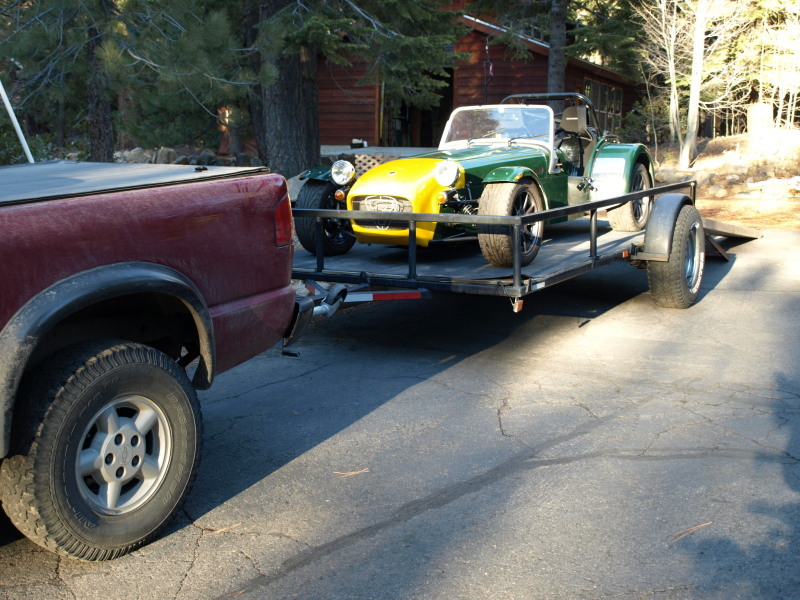 It was connected to the truck and the truck rear suspension was way up (the little wheel taking the weight of truck & trailer). 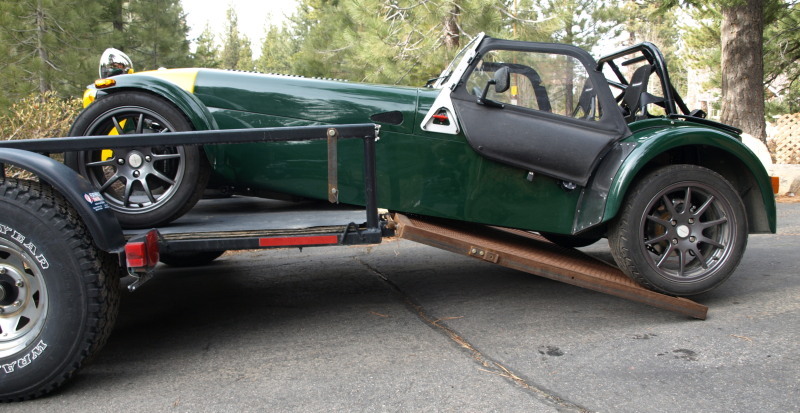 This lowered the back of the trailer to 18″ above ground – but the seven was still stuck. If I had disconnected the truck, then the weight of the 7 at the back, now being heavier than the front, would tilt the back to ground level in a hurry, the 7 at this point would not be held back by the stuck transmission and with a rear trailer incline, would roll off the trailer. 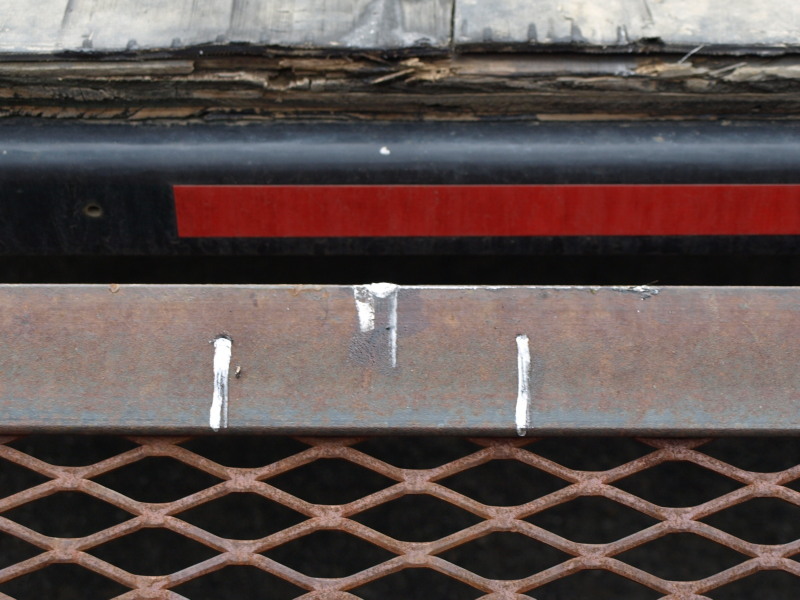 Lightened of the load on the rear of the trailer and the fact that it is front heavy, makes the rear go up, hitting the nose of the seven & ripping it off. Consequently, as the back went up, the front tow end come down, hitting me squarely on the head (I’m not as good as WC). 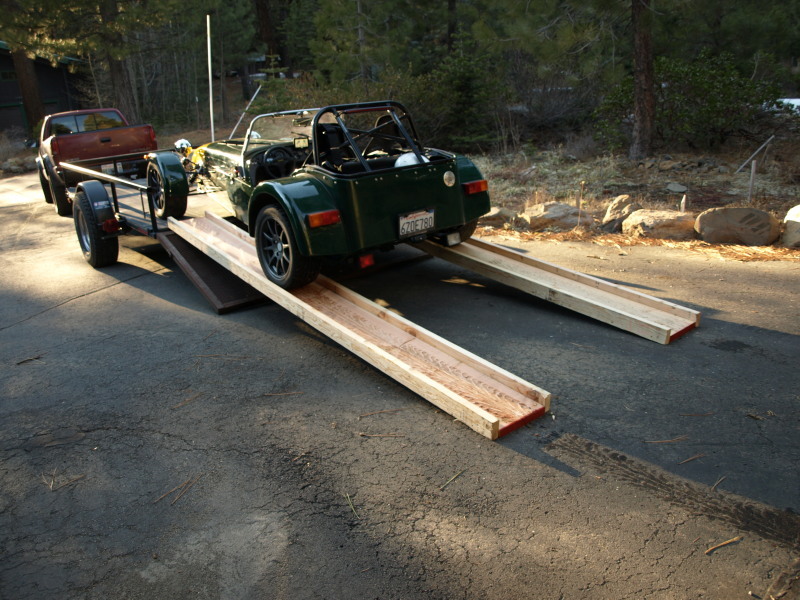 Actually , I ended up jacking the car front up by 6″ and rolling the jack backwards being careful to not have it twist & collapse. Once the transmission was over the edge, I lowered the jack and gently let the seven roll down with one hand at the handbrake. Disaster averted! Well. the 7 is definitely a summer car. So looking for something to do some winter driving, meaning snow covered roads & dirt trails. Something with 4 wheel drive – which points me to a Subaru or Audi A4. 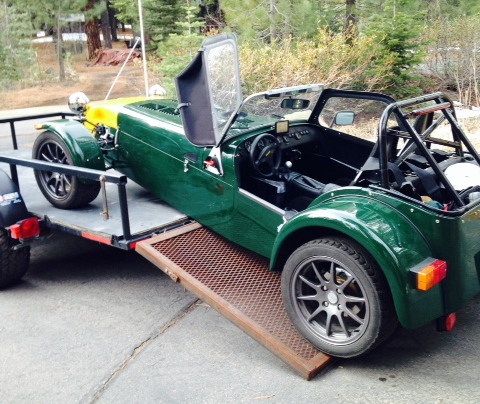 I’ve been looking for a project car for a few weeks on Craig’s list and found one on Saturday. Dot & I drove down to Sacramento and bought a 2001 Subaru Impreza 2.5 RS for $3000. The good news is that the car body is in good shape, interior is almost perfect and its a 2 door coupe. The bad news is the engine is clapped out at 220k miles and the 4th gear pops out. So it needs a new engine & transmission. Red and Yellow and Green and Blue…. 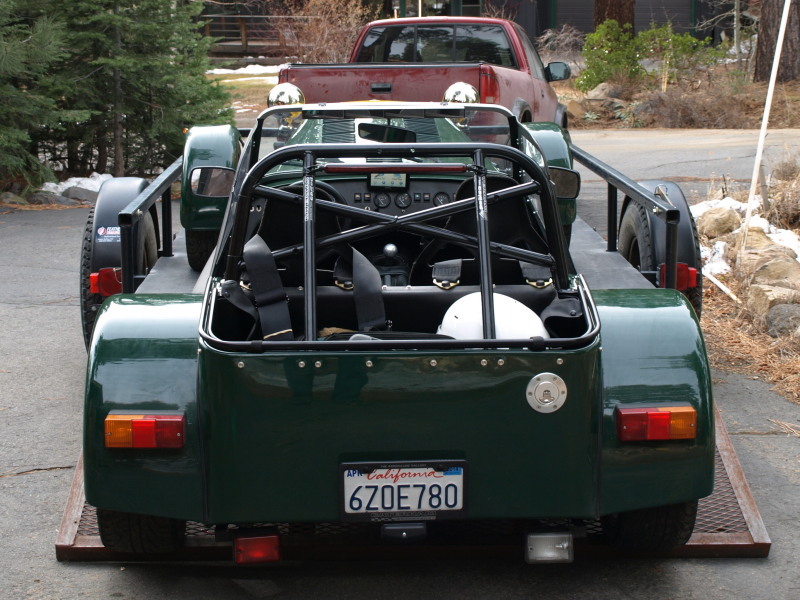 I have had the Caterham 4 point standard harnesses. But don’t like them mainly due to the un-adjustability. 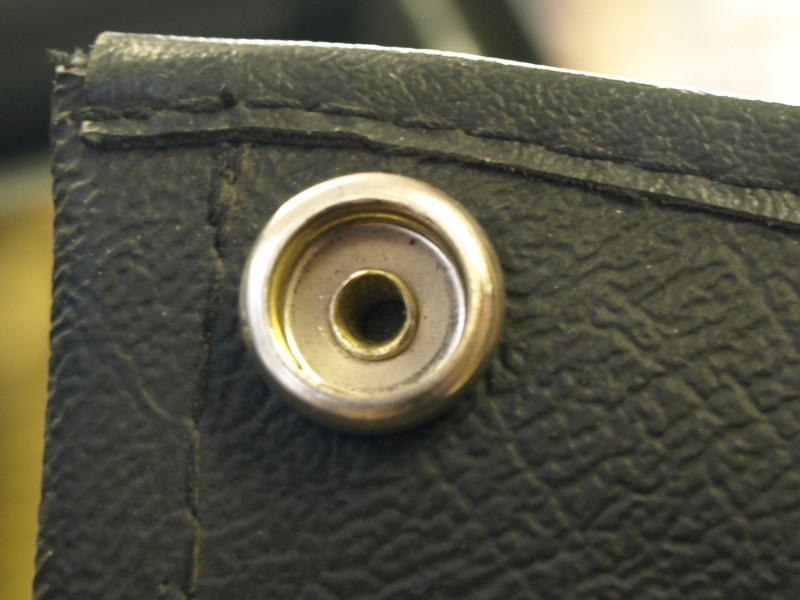 The adjusters on the lap straps end up being behind the belt holes in the Tillet seats. So to adjust you either have to remove the seats or struggle for a good 1/2 hour with tiny movements – totally impracticable, especially on the passenger size. I had adjusted the driver’s side for my size and have not touched it since. 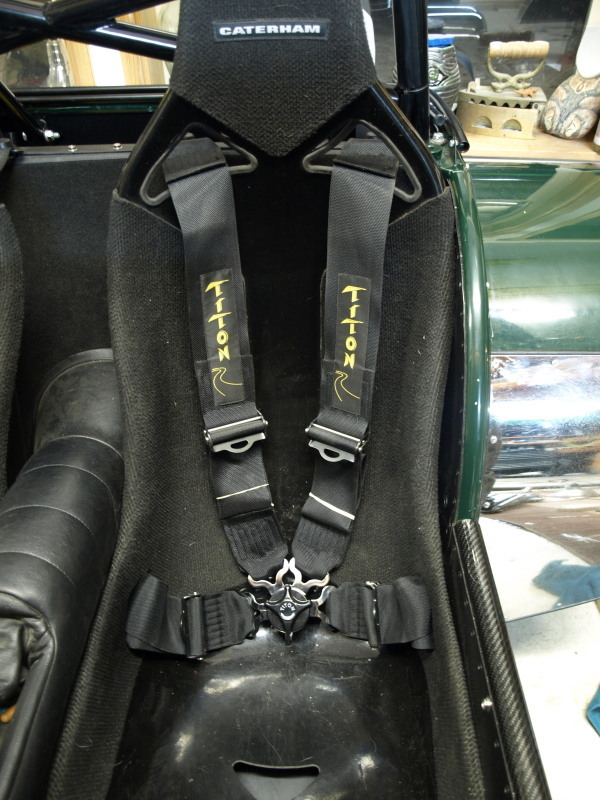 So, I ordered a pair of Titon racing harnesses on Mark’s recommendation (see blog CSR175), from Seven Speed in the UK. They arrived yesterday. 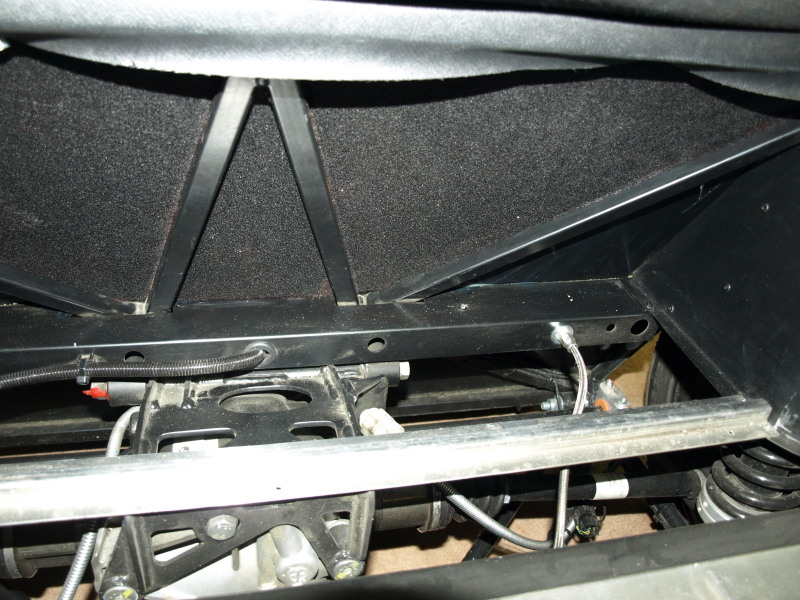 To fit them, I had to take out the seats as well as removing the old harnesses. Putting the seats back, particularly the adjustable driver’s side was tricky and took a while. 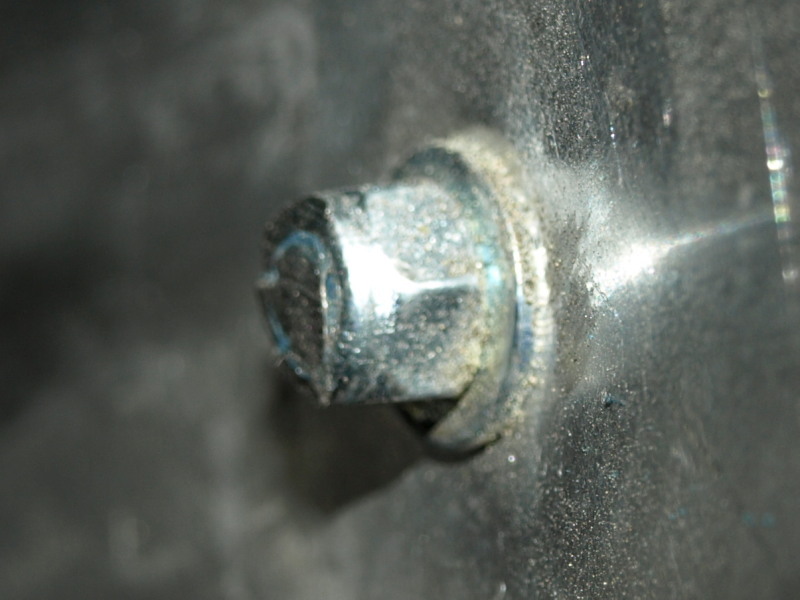 It was a matter of getting bolts aligned with holes and pushing them in by feel because you can’t see them. Large hands don’t help, but long arms do. So it took a while. The lap belts adjust from the buckle end, which means they’re not hidden behind the Tillet seatbelt holes. That was the main reason for getting them. 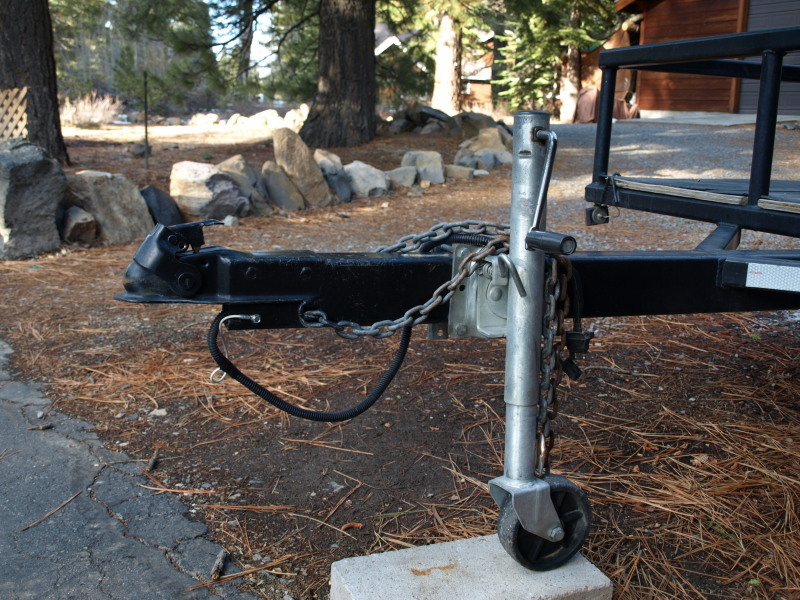 The only downside is that you have 4 pieces of slack near the center buckle each over 1′ long. I used rubber bands to capture them. It was thinking of cutting them short, but that would probably violate the safety considerations and they may become illegal for a track situation. 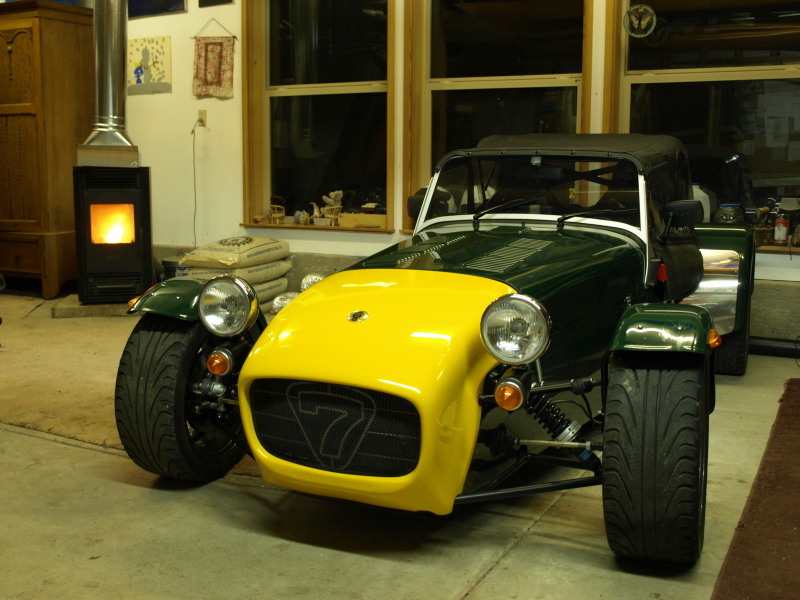 The webbing is also 50% wider than the Caterham belts. We have a large barn/workshop/garage and lately Dot has taken up re-covering car seats. So has had the pellet stove fired up in there to keep warm. I took a couple of pictures of the Seven keeping warm. 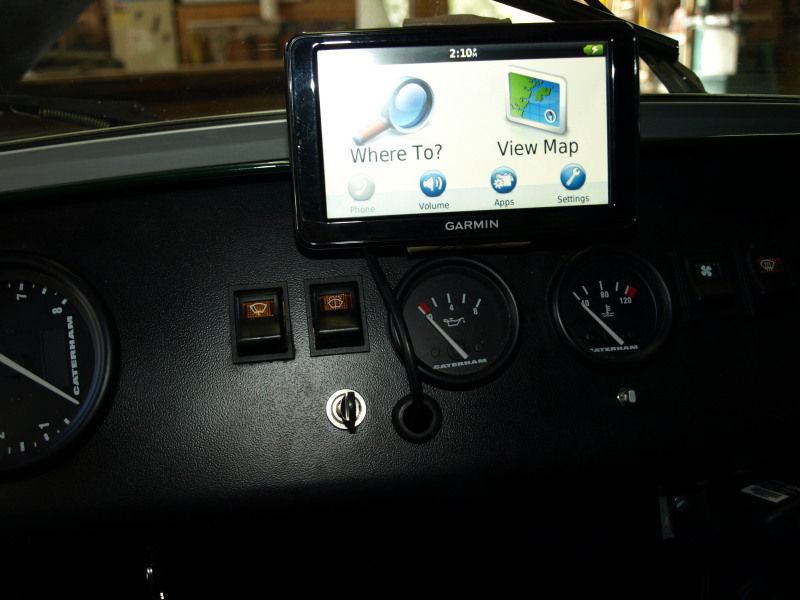 I have not been happy with the standard suction cup attachment that comes with the standard Garmin GPS. It cannot put the GPS where I want it. 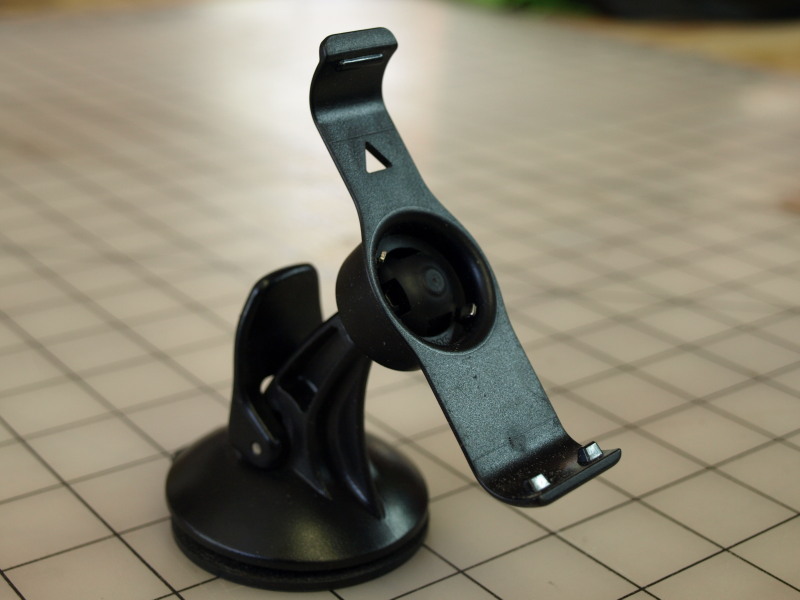 I couldn’t find alternate mounting mechanisms on the Garmin website – so, its time to design my own. 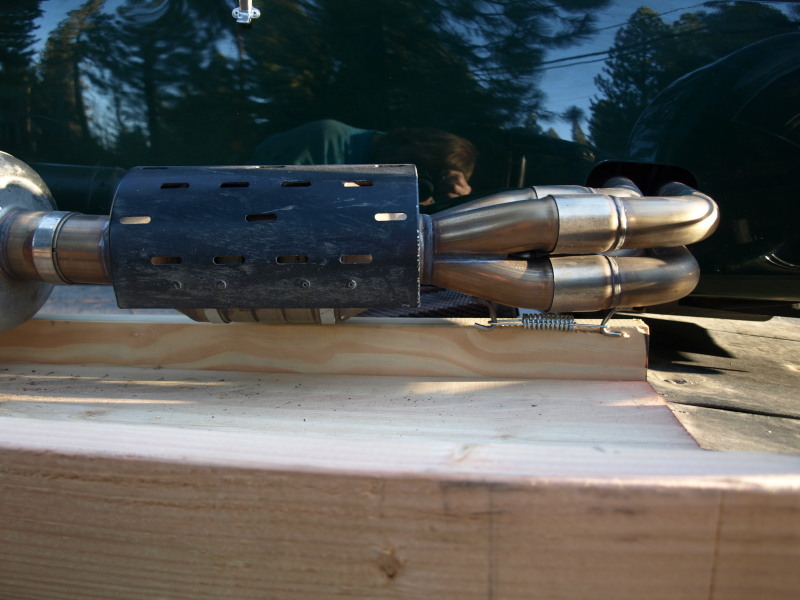 I took a piece of steel ~ 3″ x 1″, fashioned the 2 ends to match the Garmin fittings on the top & bottom of the GPS. Then welded an angle piece of steel to the back that will mount onto the top of the dashboard. I finished the front of the bracket with some soft leather, primarily so that I don’t damage the mounting points on the GPS. 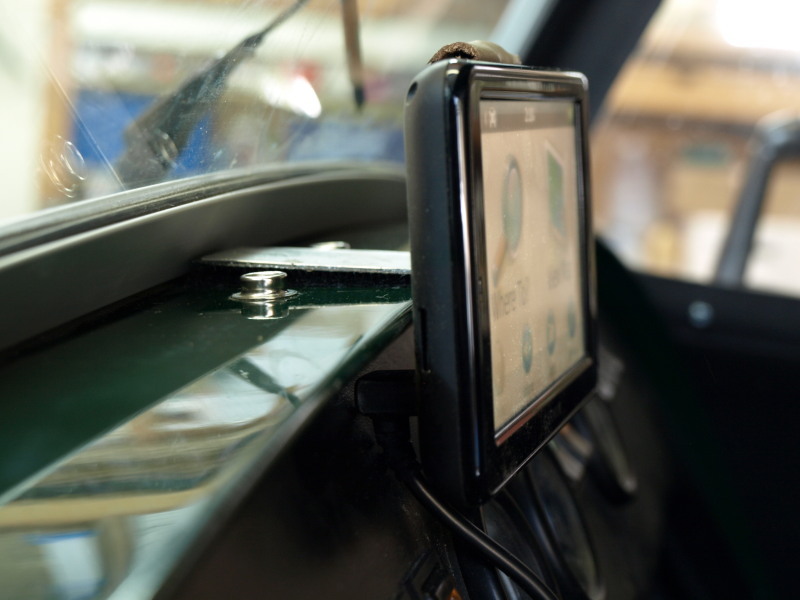 Then attached a velco fastener on the mounting tab to mate with the dashboard top. It seems to work, its functional but not very elegant. It was a wet & rainy day. The 6″ of new snow from yesterday had now turned into slushy slop with the consistency of wet concrete. So much for going out early on cross-country skate skis. 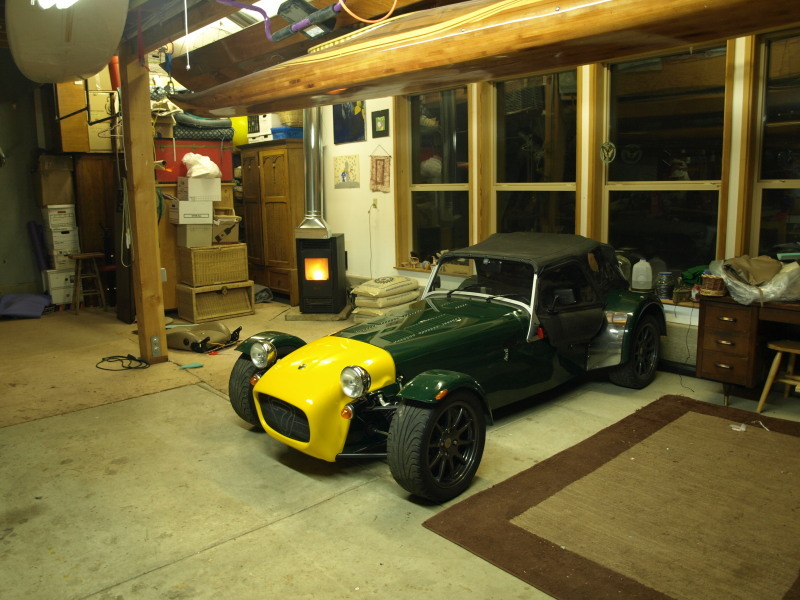 I shovelled some snow off the driveway, but decided this was really hard work and that it was the perfect day for finally installing the carpet segments into the boot of the 7 – I was waiting for such a day. Before putting in the carpets I had to trim off the bolts holding the rear wings. 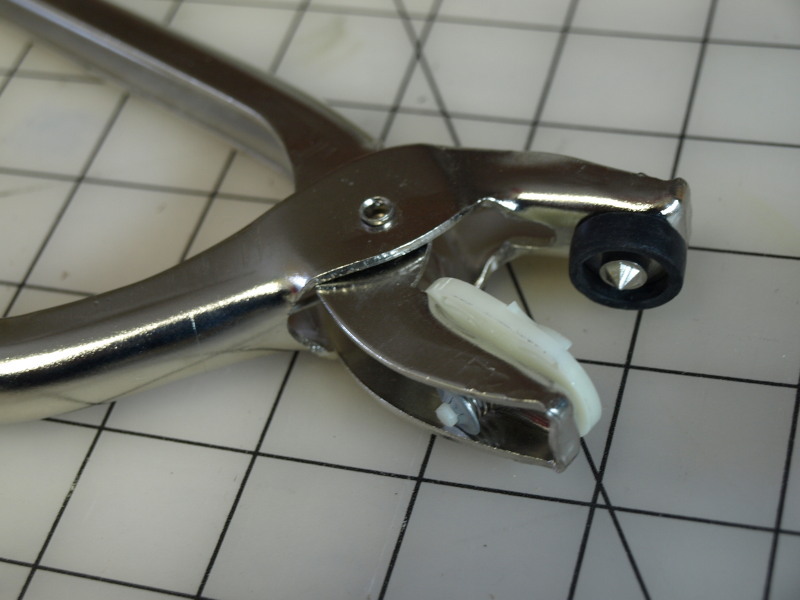 These stuck into the boot by about 1/2″ past the nyloc nut. 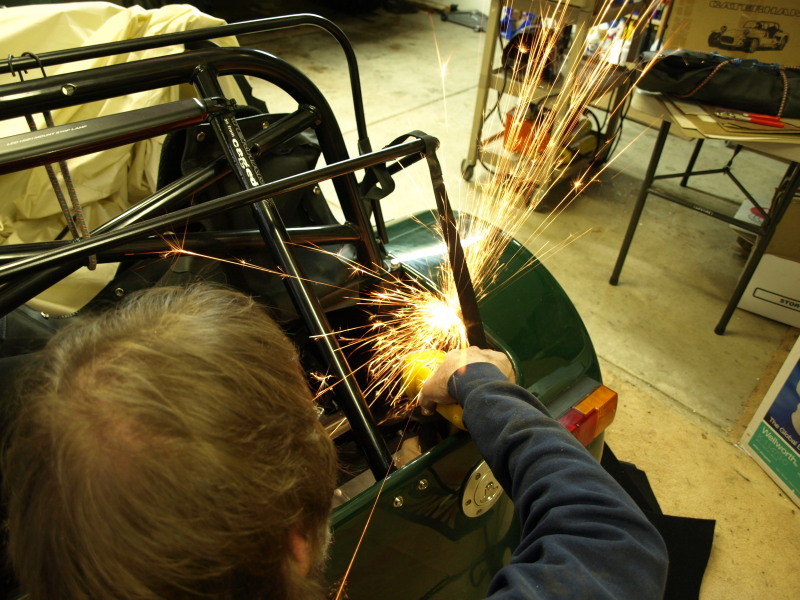 The grinder made lots of sparks. Installing the carpet segments, which were pre-cut to match the size & shapes of the boot cut outs, was straightforward. 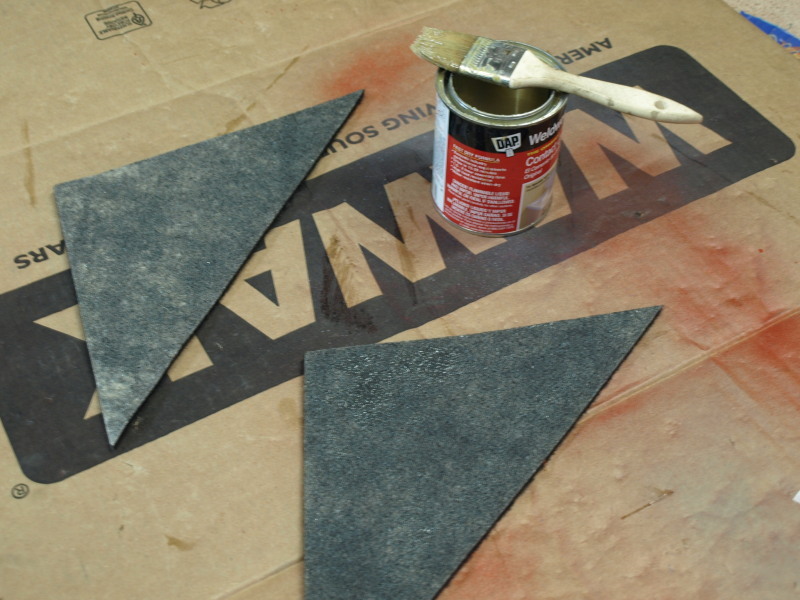 Just coat the carpet back with contact adhesive, similarly for the boot, let stand to 10-15 minutes, then stick in place. 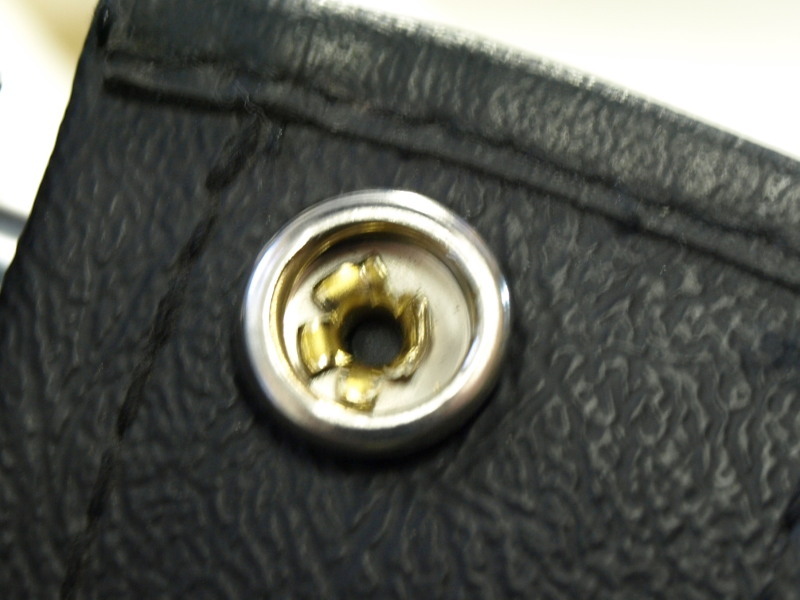 Then I had some poppers, that had come loose on the boot cover, needed replacing. 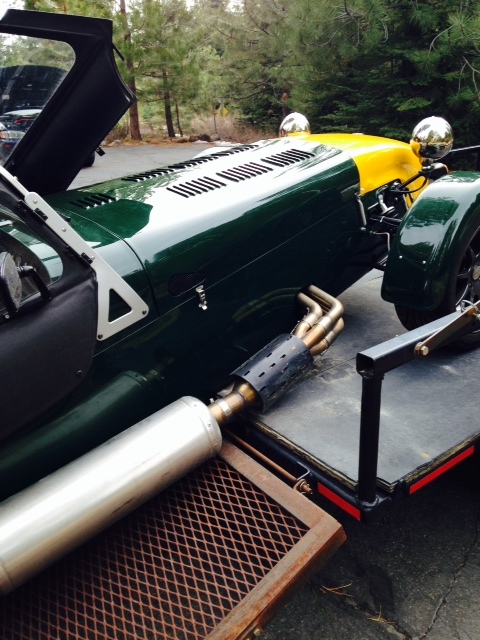 Caterham supply a punch to install the poppers, but the punch does not compress the popper well enough and they fail early. Dot had a special tool, so I tried that. Looks like its more aggressive and provides more metal bent over.